How can you make the internet a safer place for your children? It’s a common concern as all parents want their kids to be protected and happy whenever they go online. It’s relatively easy to supervise and monitor the very young ones as they stare delightedly at the Disney Junior site, but the risks increase greatly as kids get older and more independent. 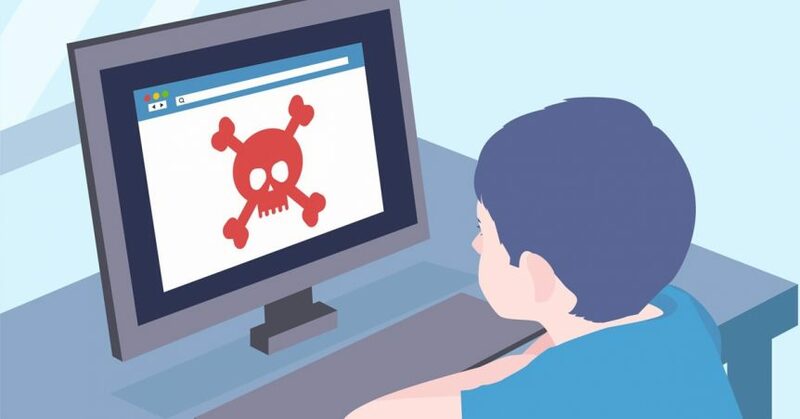 Most kids can’t tell the difference between a legitimate download and a scam/malicious link. It’s not their fault, the online world is full of things that will trick even the most savvy adult. The difference is that kids tend not to take that extra moment to check exactly where that link is pointing, question whether it’s too good to be true, or even read what they’re agreeing to. They want to get back to what they were doing, and if something pops up, their first instinct is to click ‘yes’ – purely so it goes away. Unfortunately, that single ‘yes’ may have just opened the doors to malware and viruses that will ruin their computer. Set a family rule that they need to ask permission for all downloads (and an adult will check it first), and to never click a popup. When you’re called over to give download permission or check a popup, talk through exactly what you’re checking and why. As your child matures, get them involved in this process so their safe habits extend outside the home. Otherwise you will end up likely needing someone like us for virus and malware removal. Most youngsters think the internet is a magical place and can’t imagine their life without it. To them, the internet is on the same level as oxygen! With that acceptance though, comes unwavering trust that the internet would never lie to them, never trick them and never hurt them. While we adults know better, it’s only because we already view the internet with a certain level of distrust. The best way to keep kids safe is to teach them to approach every aspect of the internet with critical thinking. That includes teaching them to question the motives of other people online. Is that person really a kid? What do they really want? Unfortunately, all kids do need to be aware that predators use the internet to target and lure children. Ensure your children tell you immediately if a stranger makes contact. Along with this stranger danger, teach them to identify what marks something as suspicious, and what they should avoid. If they come across anything inappropriate, they should shut down the computer and come straight to you. Kids have an overwhelming drive to contribute to the internet, they don’t think twice about recording a video, jumping in a chat room or onto social media. The world really is their playground! But what they don’t understand until they’ve been burned, is that anything they upload, write or say is on the internet forever. Even if they delete it or use a platform where content self-erases, someone can still screenshot and send it right back out. Many cyber-bullying cases are based around this exact type of blow-back. Once your kids know that everything they post is permanent, they’ll be more likely to pause and think.